Safely tucked inside orbiting habitat, space explorers use telepresence to operate machinery on Mars, even lobbing a sample of the Red Planet to the outpost for detailed study. This technology could also find use in investigating hellish Venus. GREENBELT, Md. — Advances in telerobotics are in high gear here on Earth, enabling scientists to plumb the deepest oceans, extract resources from dangerous mines and even carry out high-precision surgery from thousands of miles away. Now researchers are considering ways to adopt and adapt telerobotics for more far-reaching duties — in outer space. The ability to extend human cognition to the moon, Mars, near-Earth objects and other accessible bodies remotely could curb the challenges, cost and risks of deep-space exploration, some scientists say. Astronauts, robotics experts and space scientists and engineers discussed such possibilities in the first-of-its-kind Exploration Telerobotics Symposium, held here May 2-3 at NASA's Goddard Space Flight Center. While landing humans on these surfaces may be an eventual ambition, extending human cognition and dexterity to these locales via telepresence might be achieved on a shorter timescale and at a more modest cost, researchers said. Establishing on-orbit proximity telerobotic control for the surface of the moon could be a good place to start, they added, with more far-flung destinations perhaps following later. Delicate, cutting-edge surgery by robotic technology could find use in off-Earth exploration via telepresence. The symposium underscored for the space community the meaning and potential importance of telepresence as "a credible exploration strategy," said astronomer Dan Lester of the University of Texas in Austin, who was a key organizer of the meeting. "Space is big, and the speed of light is small enough by comparison that we often don’t feel much 'presence' with our sensory extensions we send out into space in the form of robots," Lester told SPACE.com. As such, we really don't have any experience with space telepresence, even for such relatively close bodies as the moon and asteroids, he added. Lester said that there are countless lessons to be learned from the terrestrial telerobotics experts who attended the meeting. They brought a wide range of experience, from looking for oil and gas reserves in the oceans to performing telerobotic surgery and mining operations. "That's all happening right now, in a big way, and space exploration has a lot to learn from those endeavors," Lester said. "They don't use space-qualified hardware, but their operations management and protocols have important lessons for us." Similar in outlook is James Garvin, the chief scientist at NASA Goddard who helped chair the recent meeting. Garvin's personal view is that the growing body of terrestrial experience with telerobotics in medicine, sea-floor exploration, mining and unmanned aircraft offers many fundamental lessons. That knowledge and know-how, he told SPACE.com, can be extended both to near-space locales like the International Space Station and to deep-space destinations, to the advantage of science and engineering capabilities. Underwater Nereus robot investigates hydrothermal vents along Earth’s deepest mid-ocean ridge in the Cayman Trough. This unique vehicle can operate either as an autonomous, free-swimming robot for wide-area surveys, or as a tethered vehicle for close-up investigation and sampling of seafloor rocks and organisms. "My general feeling is that low-latency telerobotics is a critical capability that must be investigated," Garvin said, "so that future human-robotic scientific activities can open up new frontiers in our scientific understanding of Mars, the moon, asteroids, Venus" and other locations. "Clearly, there are local settings and environments where human field explorers on other worlds should never go," Garvin emphasized. And in such places, even very local telerobotic operations with machines there and people in nearby safe havens could be essential, he said. Garvin did point out that, on the science side, there is a profound lack of real experience with low-latency telepresence here on Earth in geological field situations. 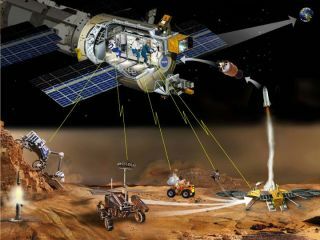 The computational crunching power of robots was addressed by Brian Wilcox, manager of Space Robotics Technology at NASA’s Jet Propulsion Laboratory in Pasadena, Calif.
"Moore's law has been operating for 50 years, with about an order of magnitude increase in computational throughput every five years," Wilcox said. This means that the throughput per wafer — at a roughly constant fabrication cost of under $10,000 — has increased from about the equivalent of one neuron on a 1.5-inch wafer using 1965 fabrication technology, to about 10 billion neurons using 2015 fabrication technology on an 18-inch wafer. Those wafers are just now going into production around the world, he said. Wilcox observed that 10 billion neurons is about the equivalent of the human brain. "Today, a game console, about the most capable consumer product in terms of throughput, has about the equivalent performance of the best invertebrate animal, the octopus," Wilcox said. "Within the next 10 to 15 years, we will likely witness robot performance marching through all of vertebrate evolution, up to and including humans." Astronauts, robotics experts from a mixture of disciplines, along with top-flight space scientists and engineers took part in a first-of-its-kind Exploration Telerobotics Symposium, held May 2-3, 2012, at the NASA Goddard Space Flight Center in Greenbelt, Maryland. A key and perhaps overriding issue, Lester concluded, is the extent to which the public and Congress can buy in to an exploration strategy that does not involve humans going all the way to an exploration site. In many respects, Lester added, what telepresence is making us do is redefine what we mean by the word "exploration." "We should understand that it is precisely the explosion of technological capability that even allows us to talk about doing telepresence," Lester said. "Forty years ago, when we wanted to put human cognition on the moon, there was exactly one way to do it … putting people there … boots on the ground. That's what we did. But it's no longer the only option," he added. Leonard David has been reporting on the space industry for more than five decades. He is a winner of last year's National Space Club Press Award and a past editor-in-chief of the National Space Society's Ad Astra and Space World magazines. He has written for SPACE.com since 1999.